The Home Run® family is growing! We are proud to introduce to the world the new member of the clan with Watercolors Home Run®. The ever-changing yellow gold blushing pink flowers of the new player complete the lineup. Now we have a Major League All-Star team. Like in humans, there are similarities amongst family members in plants. The Home Run® varieties are well known for their 'NATURAL DISEASE RESISTANCE', well-behaved rounded habit and excellent flower production lasting from spring well into fall. And you'll get all that with Watercolors Home Run®! 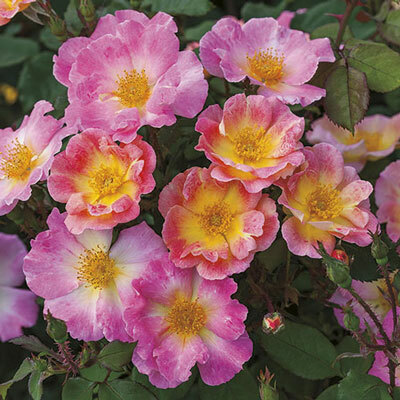 Nearly always in color with its big clusters, why don't you enjoy the Seventh-inning stretch to relax and let this rose be the MVP of your garden!